Kenn Nesbitt, of Poetry4Kids.com, has what I would describe as a very generous website. Although his work is, of course, copyright, Kenn allows kids and parents to read his poems, print them out, and listen to some read by Kenn himself. He also does a fantastic job of promoting poetry and encouraging kids to read and write their own poems. My kind of poet! Kenn's style is what Betsy Bird (of Fuse 8 and School Library Journal) described recently as subversive. He invites kids to conspire with him and have fun with poetry. Titles like Gobble, Gobble Went the Turkey will give parents and kids some idea that we are not talking sonnets comparing a lady love to a dove here. You're more likely to read about a Rappin' Rooster or a bicycle made from a pickle. Nesbitt has a very high-energy performance style that perfectly complements his poetry. If you want to find out for yourself, go to his site and listen to his poetry podcast, or read along while listening to poems like Today I Touched the Buffalobster. Can't you just see the art and writing potential of that last one? Recently, I was lucky enough to have a sneak preview of two of Nesbitt's books, and now I am a fan all over again. 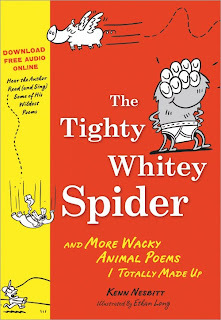 If your kids haven't yet succumbed to the delights of poetry, try them with the poems in My Hippo Has the Hiccups or The Tightey Whitey Spider. Both share Nesbitt's quirky way of looking at life. Kids will giggle for sure over Sleeping Beauty waking and reaching for the snooze alarm, or a kitten who talks because he swallows a parrot. Many of the poems rely on a twist at the end for their humour, but Nesbitt also has a range of formats and styles - all of them funny. These would make great books for the school or classroom library. Lots of kids are daunted by books they perceive as too long. Cats with jet packs and soccer-playing ferret poems make nice bite-sized chunks for a young reader to swallow. Even The Dancing Baboon of Djibouti in seven stanzas will go down a treat with Ethan Long's comic-style illustrations to break up the page and add even more humour. Sourcebooks is offering My Hippo Has the Hiccups as a freebie! You just need to register with Zinio and the ebook becomes available to you to read online, or you can download it to your own computer by downloading Zinio reader for both Windows and Mac first. (I have not tried the second option yet.) You can also listen to Kenn while you read some of the poems online - fantastic help for young readers. This is a wonderfully generous offer in my opinion. Sourcebooks obviously is so certain you'll love My Hippo Has the Hiccups that you will go on to buy The Tightey Whitey Spider. And I hope you do! You'll be getting two books for the price of one and hours of poetry pleasure for you and your kids. Priceless! http://bit.ly/bQAOVs Check out my post: Poetry Book Giveaway. Want to hook your kids on poetry? Let Kenn Nesbitt's ebook do the job for you. Sounds like my kind of website. Off to explore right now!! Really take time to explore, Jeanne. Kenn has some great lessons there teaching kids to write poetry too. What a hoot! I've posted about this over at Win a Book. Thanks for the heads-up about it! Very generous! This will teach students to love poetry, excellent! I'm excited! Can't wait to read some of his work. Just had a read. My kids are going to love the quick, fun rythmn. I agree Kelly. For lots of kids, this will be a way into a genre they might not have considered, and may well begin a life-long love affair with poetry. Great, Kelly, I'm so glad your kids will enjoy it!